In a recent post, I expressed my enthusiasm for a nutritional drink called Soylent. It comes as a powder, which you mix with water, producing a beverage that contains all the nutrients the body needs. Theoretically you could live on it exclusively, but few people seem to want to do that. Most users of Soylent probably want to use it for lunch and breakfast, and have solid food for dinner. There’s naturally a lot of skepticism about this idea, and there are unanswered questions, but none that turn me off the idea. The discussion in the comment section is worth perusing if you’re skeptical, but I don’t want to go into that here. Anyway, Soylent isn’t available in Canada yet, but a thoughtful reader sent me a sample and I really liked it. It tasted good, was incredibly easy to prepare, and most importantly, it made me feel fantastic. I ate it exclusively one day, and all day I felt light and energetic and alert. But I only had one day’s worth, so I’m making my own. 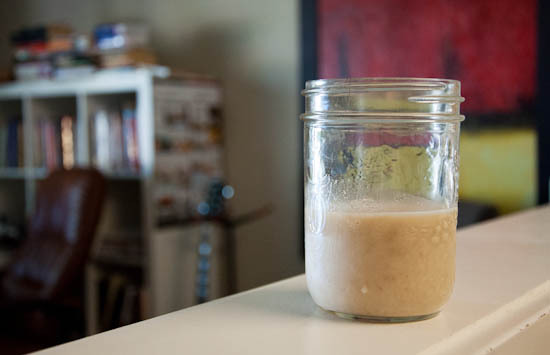 Making your own soylent isn’t as daunting as it sounds. There’s a large online community of DIY soylent makers, experimenting with hundreds of recipes. I chose a well-reviewed one with ingredients that are available locally, and now I’m doing an experiment where I consume mostly Soylent for a month. After that month, then I’ll decide what to do. Most days I’ll have soylent for breakfast and lunch and then eat solid food for dinner. There may be days when I have only soylent. I want to find out if I become healthier and feel better consuming Soylent — It almost certainly contains a more comprehensive supply of micronutrients than what I was getting. My diet is probably healthier than most people’s, but I have never tracked my intake of essential nutrients. I find mealtimes disruptive — I’m a work-from-home writer and entrepreneur, and the amount I get done often depends on how well I maintain the momentum with which I begin my workday. Breakfast delays my start, and lunch interrupts my momentum. Having to cook or prepare lunch that’s not only nutritious but satisfying is something I don’t particularly enjoy. Dinner is a different story, because I don’t have to return to work when I’m done so I can take my time and enjoy the process. I want to see if it’s cheaper than groceries — Even if you ignore the additional time it takes to go grocery shopping and prepare three meals a day, many Soylent recipes are simply cheaper than feeding yourself with groceries. The recipe I’m trying should cost me about four or five dollars a day. I want to separate eating for entertainment from eating for sustenance — This is the most fascinating part for me. We don’t just eat for sustenance, we eat for comfort and entertainment as well. It causes us to eat too many calories, and eat too much of foods that are unhealthy and too little of foods that are healthy. I think it makes more sense to remove entertainment as a consideration from most of my meals. Consuming soylent will do this. I can still have dinner with friends, still have fun cooking, and still enjoy the wonderful experience of eating, I’m just not trying to do that three times a day anymore. I want to see what other benefits/complications arise. All my experiments teach me something I never suspected. Because food is such a central part of human routine and habit, I’m sure I’ll discover all kinds of things about myself and my relation to food. There’s not much I’m worried about here. I’m not really worried that I’m going to be missing some special unknown element that is found in solid food but not my DIY soylent, particularly because I’m not giving up solid food. I think it’s more likely that my body will need to adjust to actually getting all my nutrients for once. It is possible that I have miscalculated the nutrients actually supplied by the recipe I make, but I can’t imagine that I will somehow get a less complete nutrient profile than I already was. Overdosing on vitamins is technically possible, but I have quite carefully calculated how much I’m getting of each (from the soylent anyway) and nothing seems to be flirting with overdose-ranges. I don’t know how it will affect my digestion. I would presume a mostly-liquid diet is easier for the body to digest, and my initial experiences seem to confirm this. Soylent DIY recipes are made of all kinds of things, but this one is mostly masa, and uses whey protein. It also includes almond meal, honey and vitamin supplements. The full recipe is available here, with a complete breakdown of the nutritional profile. It has a stupid name, as seems to be the DIY soylent tradition so far. I’m not crazy about using whey as the protein source — I’d like to transition to an animal-free recipe eventually but not until I tried a DIY that is actually usable. So I picked the best-reviewed one with ingredients I knew were available locally, and went with that. I do plan to change the recipe as soon as possible and I’m already developing a second version which will use less whey and more oats. My third version will probably be vegan and under 5 dollars a day. Finally got all the ingredients by doing some running around. All in all it cost me about 200 dollars, and it’s hard to know how big a supply I have. I have a year’s supply of some ingredients, and a month’s supply of others. I also bought a coffee grinder dedicated to powderizing the lecithin and vitamin pills. I made a batch to refrigerate overnight, and of course I tried it. It’s pretty good but not as good as the official Soylent I tried. It tastes like masa, vanilla and almond, and there is a soft grittiness that I don’t mind. As long as it’s drinkable, taste isn’t really a problem though, because I’m using it for sustenance and not entertainment. Today I had a full 750ml for breakfast, and it was way too much. In hindsight it makes sense, because normally for breakfast I just have a cup of coffee and maybe twenty almonds or so. Tomorrow I’ll just have a small amount (375ml) and then coffee. Refrigerating it overnight made it taste much, much better. It’s actually awesome. I had another 750mL for a late lunch (I wasn’t hungry for six hours after my initial meal) and then a small dinner of tofu, quinoa and steamed broccoli. I’ve already decided to reduce the protein in my next batch. It contains about 140g of protein per day, which is way more than I want for my lifestyle. The developer of the recipe is an active male who wanted a high-protein formulation. Had a bit of a problem with extremely slow bowel movements yesterday and today. I had fibre cereal for breakfast because the previous day was extremely high in protein and relatively low on fibre. The Soylent recipe contains the recommended amount of fibre, but I only ate 2/3s of the recipe and then had a high-protein, low-fibre dinner. Later I learned it’s probably the high iron content. You need about 8 mg a day and a day’s worth of soylent is over 20. The solid food I had on July 5 was also particularly iron-rich. I’m going to look at ways of cutting down the iron. Masa is high in iron, and I’m thinking about switching some of it out for oat flour. Other than that, I feel awesome. I also happened to get less sleep than normal two nights in a row, and I did not feel drowsy at any time during the day, even when I woke up, and I wasn’t even tired by bedtime. BMs are still slowish by not like yesterday. I had dinner at a Thai restaurant, which tasted amazing, but also made me feel a bit heavy. I didn’t feel tired or foggy, but it slowed me down physically. I definitely ate too much, at any rate. I had a beer too, and that may have done it too. It felt like my body didn’t want alcohol. I recovered pretty quickly though, and even around eleven thirty I wasn’t tired at all, even though I haven’t had more than six hours sleep for three nights now. I woke up really early, like 5am, and didn’t feel drowsy, although my body felt like I could probably use more rest. This was even less sleep than before. I ate Thai leftovers for breakfast, and felt a similar physical sluggishness but it wasn’t too bad, it just felt weird given how great I’ve been feeling. I had soylent the rest of the day and a small solid food dinner again. I felt alert and confident all day, but I could tell that my body needed more rest, so I had an hour nap, which was great. Normally naps leave me really groggy for the rest of the day, but I felt good after and went back to work. Still, I’m looking forward to a proper sleep tonight, of 7-8 hours. When I have soylent, it tastes delicious, and I enjoy drinking it, but when my jar runs out, I have no desire for more. I just carry on with my dy. But when I eat solid food, no matter how much I eat, I notice a strong urge to keep eating. I want the meal break to continue. I have always had this urge to overeat, to cling to meal breaks, but I don’t feel it with the soylent, even though it tastes awesome. I don’t have an explanation for this, except that I’m conditioned to see traditional meals as islands away from responsibility and I don’t want them to end. But with soylent, I don’t really stop what I’m doing to consume it. I keep working, so there’s nothing to cling to. This might be a personal quirk, but it’s very obvious to me. I’ll post pictures and maybe videos soon. The long sleep I had planned didn’t happen. Friends dropped by when I was about to go to bed early. It was great to see them, but I ended up going to bed late instead of early and I drank two large beers before doing so. So today I am feeling the sleep deficit, although it is mostly in my body. My mind is clear. This clarity has been here since the beginning and it feels very stable. I also feel more emotionally stable. I now have all the ingredients to make my first batch of my own recipe. It’s based on the one I’ve been using, except I switched out half the masa for oat flour, and I added flaxseed and made a few changes to the proportions. It’s significantly cheaper than the other ($5/day instead of $7). I will try it tomorrow. I am still not sure what to do at breakfast. I used to just have coffee and almonds, but now when I wake up I want soylent. This morning I had a full 750ml serving and it was way too much. I feel full. So maybe a half serving makes sense. Anyway, I have a batch of my 2nd version in the fridge but haven’t tried it yet. I hope the flax doesn’t make it gross. 2pm — So earlier I tried the new batch with oat flour and flax meal, and it is a bit gooier and doesn’t taste as good. I’m not sure which of the new ingredients is doing that, but I really missed my pure masa-based one. The new one is still totally drinkable and I’ll be living on it for the rest of the day, but I’m not going to make that recipe again. I do want to find out if it’s the oats or the flax that’s doing that though. So I’ll make my next batch as normal, but isolate a third of the batch and add flax to that, then do a side-by-side taste test to see if it’s the flax that is adding the gooeyness. If so, I’ll keep the flax out and maybe try another one that includes oat flour. Also, I have felt a bit tired today. My sleep was still sub-seven hours, which is definitely part of the problem, but I think it’s because of the stupidly large portion I had at breakfast. I had a good 750mL left from yesterday’s batch, kept in a separate container because it was the old recipe, and I figured I might as well finish it off, but it ended up being a lot more than I thought, and so it knocked down my normally good morning energy levels. I feel a lot better now, but I don’t feel awesome like I have been. 4pm — I had a little bit more of the oat-based soylent, and it seems that it is much more filling than the other one. It’s quite heavy compared to the masa one, and I couldn’t drink very much of it. I think there’s just way too much oat flour, and it might actually be pretty good if I cut it down from 50/50 masa/oat to about 75/25. This would accomplish two things: make it taste lighter and better, and also make it more filling so that I wouldn’t get hungry as often. I got a good sleep and I feel awesome again today. Like many have said, I notice regular food tastes stronger and in many cases, much better. Junkier foods often have too much flavor and I can taste their excess of salt and flavorings. But decent food tastes awesome, and I’m satisfied by smaller amounts of it. I have also noticed a sensitivity to caffeine. It just doesn’t make me feel good. I feel like my body doesn’t want it. I normally drink two homemade double Americanos a day, one in the morning and one in the afternoon. This is about 300mg of caffeine, which is a significant amount, but nothing compared to what many coffee drinkers take in. I just dumped out my afternoon coffee. The morning one seems fine, but the afternoon one just seems like too much. I may phase out coffee altogether. It’s been an important part of my sitting-down-to-write ritual, but I know I’m probably better off without it, and I think it’s better for my morning meditation if I abstain. We’ll see. Not much to report from yesterday. Still feel great, still feel a strong desire for physical activity. I went for my normal run yesterday, and then at 10pm I went for a bike ride, and came upon the Pan Am public sports grounds. The place is usually packed in the summer, but today it was empty, and so I just started doing laps on the asphalt biking/running track. It felt amazing and it was as difficult to tear myself away from it as television once was. I took flax out of the recipe altogether and added a bit of psyllium husk to round out the fibre content. This got rid of the gooeyness. I think I’m going to stick with this recipe for the time being. The last few days I have noticed that there’s maybe an hour or so every day when I feel a bit off. It feels like I’ve had too much caffeine, or I’m a bit hungover. It’s not that bad a feeling, in fact it’s the same feeling I’ve felt on many days when I didn’t get enough sleep or I overindulged in caffeine. But compared to my normal state of feeling pretty great, it’s very conspicuous and I’d like to find out what it is. It may be caffeine itself, and so I’m going to have a no-caffeine day to find out. It is also entirely possible that it’s just that I’ve become much more sensitive to what are normal fluctuations in energy level and mental clarity, because I’m so used to feeling so good normally. But first I will test if it is a side-effect of caffeine. After doing some reading I now suspect the “off” feeling is just a post-meal carbohydrate crash. I’ve experimented with smaller portions more often, and this seems to eliminate it, even if I’m still drinking caffeine. Drinking a third of a batch of soylent in five minutes is quite a sudden, large dose of carbs, and many people experience dips in their energy and alertness after such a dose. It’s still quite mild compared to how I normally feel after eating too much solid food (like at a buffet or something) but it feels significant when the rest of the day I’m feeling awesome, and I’d like to not experience it at all. But I don’t particularly want to eat six times a day, so I’m going to see what happens when I decrease the carbohydrate ratio and increase fat and protein for tomorrow’s batch. My hope is that I’ll get hungry less often and won’t have the same crash after eating, but we’ll see. So the increased protein version didn’t seem to improve my after-meal dip. In fact, I think it’s a little worse. I’m beginning to think that it’s just a normal after-eating energy dip, except that it seems extra prominent because I’m used to feeling so light and airy the rest of the day. So I’m going to go back to the normal recipe but I’m going to keep trying things to see their effect on the after-meal dip. I began to notice this around when I introduced oat flour to the recipe, so next batch I’m going to leave it out. Part of the reason I included oat flour was because it seemed to make it more filling, but that filling feeling seems to be part of the dip. I think it is the oats. I made an oat-free version and the after-meal dip was barely noticeable. I still have some of the oat version and will have that for my next meal, and then see how I feel. Satiety doesn’t seem to be any different. I was initially attracted to the oats because they seemed to be more filling, but I don’t get hungrier any sooner. The oats do make the consistency a little nicer though, and there’s less settling than when it’s all masa. I’m going to continue to try other things in place of the oat flour. -Solid food tastes better. It’s really nice I don’t really crave it, but when I’m eating it I want to keep eating it. But I am satisfied with less of it, because I’m not worried that I’ll get hungry too soon after, knowing that I can supplement with a bit of soylent. -There is a lingering aftertaste that can be annoying. I often have to brush my teeth immediately after, or drink coffee. If I was going to have soylent out of the house I would need to have some mints or gum in order to be comfortable. -Many people have excessive gas on soylent but I have not. I feel lucky. -My poos have been pretty excellent. Agreeable, concise, even kind of good-looking. This is a relief, because things were kind of slow-moving that first two days. 8pm: I’ve noticed something interesting over the past couple of days. It’s summertime and I go bike riding every evening, and often I smell barbecue from people’s backyards. The taste and smell of traditional food is heightened for me now, but I don’t have the same cravings for it, even when I smell something good. I can think about it, and I would like to eat it, but I’m not overtaken by food lust like I used to be. I think it’s because I feel generally good all the time. My normal state is a satisfying state, so I feel less of a need for additional sense gratification. Eating something delicious would be nice, but it doesn’t seem all that much better than not eating it. The effect is that food is attractive to me but it doesn’t trigger the dopamine response that turns me into Homer Simpson any more. Quite convinced the oat flour has to go. I just had another portion for lunch and it just sits really heavy in my stomach and makes my head a bit heavy. The oatless version doesn’t do that. I’ve seen others describe the same issue with oat flour in their DIY recipes. I’ve felt a strange sensation these days. I keep reaching these points in the day where it’s not obvious what to do next — I have to consciously decide what to do with myself several times a day. Yesterday I realized what’s happening. Suddenly I have way more time every day. Without meal prep, grocery shopping, dishwashing and sit-down meals three times a day I have about 3 extra hours every day, and it’s giving my days this weird spacious quality I don’t remember ever having before. This is made even weirder by the abundance of physical energy I have. I also need less sleep, and I also don’t have the 30-60 minute “groggy period” just after I wake up. I can get out of bed and do things right away. So I can sleep longer if I want, but I really don’t need to at all. I also don’t have a groggy period before bed either, so my days are effectively 4-5 hours longer, and I often don’t know what to do with myself. I can work longer, but I do start to get restless if I sit at a desk for even longer than my normal 8-9 hour workday. So I end up feeling like I’ve experienced a whole day already by 7pm, and then I still have another 4 waking hours and loads of energy. So there’s this big void to fill. There are certainly worse problems to have! But it is kind of disorienting, because I’ve spend the last 30 years with a totally different conception of how long a day is and how to move myself through it. I have to really redesign my daily routine, and it’s nice to have so much space. I’ve been meditating first thing in the morning now, instead of waiting until mid-morning, when my groggy period is over. I’ve also been exercising in twice a day — one fairly intense workout or run and one low-intensity activity like biking. Aside from my physical activities this hasn’t yet made me more productive exactly. I am still prone to decades of evasive work habits and the ever-present distraction of the internet. I also seem to have a finite amount of patience with desk-work, and that hasn’t increased with my available time. But whatever I do, there is space to work with now. I’m even thinking of creating a sort of “double routine”, where I go through a meditate-work-exercise sequence twice in one day. This is really new to me and I’ll find a way to get used to it. As of right now I have a very open canvas. Not much new to report. I’m still flip-flopping on whether to remove the oat flour, because over the past couple of days it hasn’t been much of a problem. Or maybe I’m getting used to it. It does make the consistency better — the more masa there is, the more settling there is. The euphoria of suddenly being healthier is starting to wear off — I still feel good all the time, but this has become normal. I’m really wondering about how I’ll respond to long stretches of not having soylent, if I’m traveling or something. I’ll be in Ecuador for almost three weeks later this summer, and if I bring soylent, I won’t be able to bring much. Will I be more sensitive to nutrient shortages? Who knows. Over the last two days I had recurring stomach discomfort, but I figured out why. I made a bad batch the other day — I decided to grind up the multivitamin instead of taking it separately and this made it taste horrible. I also used hemp hearts instead of almonds (which make it taste great) and so it was really unappealing. I added cocoa powder to make it more palatable, but it turns out the cocoa was rancid. I’m back on my normal, masa-based recipe and it tastes great and I feel great again. Nothing notable has happened, except a pizza incident the other day. I got the idea into my head of making pizza for dinner, and so I went and did that. It was really good but I ate way too much of it. The next morning I felt pretty groggy — like pre-soylent groggy. It was a helpful reminder of how much of an effect overeating has in the short term. The feeling I had was one I used to have frequently — slow, reluctant to do physically demanding things, and craving comforts like television and more food. I felt fully recovered near the end of the next day. On the recipe front, I think I’ve pretty much settled it for now. I increased the protein to help satiety in the absence of oat flour. My current iteration is called “Urban Ambrosia 1.5” and you can see it here. You’ll notice the iron and folate are below the RDI. I get tons of folate because I eat broccoli nearly every day. I probably get enough iron, but it’s proven hard to track. The iron content reported in masa varies by huge amounts, like 500% or more. The manufacturer’s website says there’s only 2% of the Recommended Daily Intake per serving (or around 16% in the nine servings that come in a typical masa-based soylent recipe) — but their website also claims (erroneously) that women need 500mg of iron per day which is approaching toxic levels. For my recipe I have the calculator set to the lowest opinion of how much iron is present in masa, so that if anything I underestimate what I’m getting. This has been a major revelation — nutrition data is really hard to verify, and you get wildly varying accounts, even from the manufacturer. I tend to go with the lowest credible-sounding amount, while staying well shy of maximums. But it’s really just semi-informed guessing. Still, I have a much clearer idea of how much of each I’m getting than I did when I wasn’t even trying to track nutrient intake. And then there’s the issue of absorption — I really have no idea how much of any given nutrient actually gets put to use in my body, I just know how I feel. Nutrition is complex and nearly every claim made is contentious. For something so intimately important to our well-being, it’s amazing how fuzzy our collective nutrition knowledge is. Well the thirty days have come and gone, and it’s all quite normal now. I like eating this way. I get all my nutrients (or close to), I overeat far less often, I have several extra hours every day, I feel great and I’m spending less on food than I have my entire adult life. I have discovered some fascinating things about my relationship to food and mealtimes, and I think other people will gain a lot from them. My philosophy certainly has changed. I want food to be only about sustenance most of the time. I find I’m enjoying the other aspects of food — the social and sensual parts — more than I used to, because I don’t take them for granted any more. There’s a lot to say, so I will do a final report as a blog post in the next week or two. I think you’re probably right about the flax seeds making it gooey. If you just add flax to water and wait a few minutes, you end up getting a kind of goo, which incidentally is a great egg substitute for baking. I’ll definitely be keeping a close eye on this experiment. Yeah, I took the flax out for tomorrow’s batch. I have used flax as an egg substitute before but I thought it had to be heated to become gooey. It really wasn’t that bad after sitting in the fridge a bit, but I’d still rather not have any flax. It takes an enormous amount of energy to digest, so I am not surprised by the increase in energy. My iron has been low and digestion sluggish so this is very timely for me. I’ve read that almonds can interfere with iron absorption though. Macadamia’s might be a good sub and will offer more fat so less need for flax. I may add some powdered chaga to the mix. Thanks! Do you have any info on almonds and iron absorption? Macadamias are awesome but quite expensive and I would have ti find a way to grind them. Right now I’m buying ground almonds. Small blender/chopper (Ninja, Cuisinart, etc.) I have one that I make my pesto, salsa, cashew butter, etc. I’m intrigued. Curious to see how this plays out. I like the option of simple, nutritious meals too. 5$/day still seems a bit pricey for two liquid meal replacements? Thanks for sharing. We should be clear that we’re not talking about two cans of slim-fast here. The five dollars buys you 2,000 calories and every macro- and micronutrient you need. It’s hard to imagine a cheaper way to accomplish that. If you only use it for two-thirds of your food consumption then it’s only three-something a day, and there are recipes that are even cheaper than that. This it’s a valuable experience that you’re sharing, I’m curious what will be your final impression on the experiment. One of the things I was curios about in life was how does what man eats influence the way he thinks, feels and behaves. For me, from my life experience and lessons, every new kind of action we make changes something in us, even if in a subtle way which only people knowing themselves very well can notice – and that involves what we eat too. One can notice the different personalities that eat vegetables or meat, also changes in personality when switching food types. I don’t say it as good or wrong, it’s a NEED for the people to eat what they eat in order to be able to go on with their live, to express themselves. For example meat gives a more down to earth personality with different or opposite attributes (eg. for a heavy worker or people who needs to express their will) than vegetables (eg. good for an artist which needs more inspiration, let’s say it needs to be with the head in the sky rather on earth). Milk would be in between. Sometimes people need to change what they eat in order to be more balanced in life. Also smoking for example can be helpful for a too earthly personality so they detach themselves from being too earthly, but for an artist it could be too much, which maybe should be more down to earth. Sorry for my english, hope I managed to make the point. Personally I don’t agree with the use of a man created substance as food since as I experienced all things have a purpose and I’m sure that people eating food that is/was once alive has a purpose. Eating food created by nature it’s one of the things that makes us human. It’s easy to see the benefits of being faster to make, not having a big appetite, no social interaction, and so on as benefits, but as said these makes us human and there are many lesions to learn from that – as you have repeatedly posted till now. I think there is a step where one needs to accept to live as a human on this earth and make the best out of it, that involves preparing own food, having interactions, control of own appetite and so on, not by running from them but by making the best out of them. And by doing just that human gain a lot of qualities, balance and direction. I don’t find the distinction between man-made and natural to be a hugely important one, even though I know that’s not the most popular opinion. Nature is full of carcinogens and toxins too, and man-made foods are not necessarily all toxic or unhealthy. I am trying to stick with the evidence, and my personal experience in this experiment. I know antioxidants aren’t essential nutrients, but if you do wish to add some I suggest using Amla powder. You can find it at most Indian grocery stores. It’s essentially dried and crushed gooseberries in powder form. It doesn’t have a strong taste and it’s so charged with antioxidants that you’d only need to add about a teaspoon of it per day. Here is a short video about it. I don’t know much about antioxidants. I will check out amla. Thanks Shane. I’m very intrigued by this experiment. Even if it were more expensive than five dollars I still think the time you save makes it worthwhile. I like cooking meals because it gives me a chance to zone out a bit (similar to what you allude to about washing the dishes manually) but I always feel I would enjoy it a lot more if my having a nutritious meal didn’t depend on it all the time. With Soylent having a nutritious meal at low cost (both time and money) is a given, which is why I’m really interested to see how this pans out. Hi David. That’s one of the great things about it. You can still make solid food whenever you feel like it, or you can go with soylent if you don’t have a lot of time or you don’t want to go through the song and dance of cooking. That would definitely make me more motivated to cook. I found a ‘local’ recipe on the Soylent website that I want to try soon. Will you share your final recipe? I think I’ve found the answer to this by reading but just want to absolutely clarify: are you blending the multivitamins into the drink or taking them separately? It sounds like you take them separately but I just wanted to make sure, as I’m starting with this formula myself tomorrow. I’m taking them separately. I tried grinding them in but it really makes it super gross. The GNC mega men pack has the nastiest tasting vitamins ever. Some people use other multivitamins that aren’t as bad, but these are. Thank you David for the prompt response and the thoughtful email!! I’m just going to try the recipe you based yours off of as it is, so no oar flour. I’ll take a look at yours and maybe make some adjustments after a few days. Oh! Sorry to pester you with questions, but I also meant to ask how much of the drink do you end up with for a full day? Just wondering so I know how much water to put in. Did you keep track of how much water you use for the full batch? Just don’t want my first batch to be ruined! I put in 8 cups. Definitely let it sit overnight. Thanks for the email again David! I have one more question because I made up my batch last night and I’m really not liking it… The taste is fine, but it is very, very powdery. It feels like I’m drinking powder slightly diluted in water. Is it because I didn’t use 2 litres of water, but probably closer to a litre or a bit less? Or did i put in too much masa? I weighed 280g of masa so I thought that would be correct but there’s no way you’ve been dealing with drinking this for most of a month, it hurts to swallow! Yeah, that’s just not enough water. Often I’ll put in a little more than 2L, so that once it’s combined with the powder it’s 2.5L, or ten cups, so that each cup equals 200 calories. You can just add an extra liter of water now, and blend it, and it should be a lot better. There will always be some undissolved masa. Drink it out of something that you can shake (or swirl around) while you drink, otherwise there will be masa left in the bottom. I drink it out of 1L mason jars (about half full) and I swirl it around between sips so that it keeps the masa suspended. Sorry my comment didn’t reach you in time! Thank you so much for all of the responses David!! I will make a fresh batch tomorrow with more water, if it doesn’t get more drinkable than it was today I don’t think I’ll be able to handle it. Hi David, just wondering if you are concerned about using gmo soy, canola and corn (masa) in your shakes. Also, check out moringa powder, a good plant protein source. Have you learned of food combining, combing starch a dprotein makes digestion slow and inefficient because starch and protein require different pH to digest. When combined the protein is attempted to be digested while the starch rots. You can track by doing a good combining experiment, starch with fat and protein with fat versus starch with protein. Keep starch (masa, toast, oats) separate from protein. Steamed veggies go with starch or protein! I don’t recommend anyone to consume soy products (tofu, soy cheese, soy milk) aside from miso and San J tamari. Soy is big money industry, it wreaks havoc on your hormonal system whether you are a boy or a girl. Worse then alcohol. Too many estrogens in soy so a bite of tofu has the estrogen of 2 birth control pills. It takes a long time to reduce the havoc of consistent soy consumption. Soy also suppresses your thyroid. Thyroid is needed for bouncing out of bed! Thank you, I enjoy your articles! I knew these basics of combining foods but it is good to find it explained on one place. I did not know about soy though. Thanks! Are you still doing Soylent? If so how do you feel? Sorry. Just saw the update. Thanks. I’ve been trying to convince myself to try soylent, but it just seems like eating rice & beans, plus a protein shake and multivitamin are nearly just as easy minus the bloating and you get to actually eat food. Or even if you want a liquid drink, the traditional banana, oats, protein powder, and peanut butter, plus a multi vitamin will do the same.